When the ball of the hip can be pushed out of the socket of the joint, using gentle pressure, the hip joint is said to be loose (unstable), "dislocatable", or "Barlow Positive". Up to 1 in 6 newborns have some hip instability with the vast majority correcting themselves without treatment in the first few weeks of life. 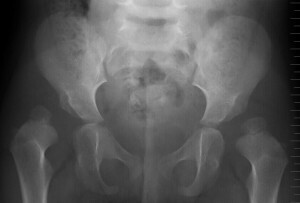 When the ball of the hip is not sitting inside the socket of the joint, but can be repositioned back into position, it is said to be a dislocated but relocatable hip. A "click" is often the word associated with a "Ortolani Positive" results but "clunk" is more appropriate according to Nicole Williams (Healthy Hips Australia Board Member and Head of Orthopaedic Surgery at the Women's and Children's Hospital in Adelaide). This is due to the fact that there are many normal causes for clicking sounds, making this a common presentation in many normally developing hips. Once walking, clinical observations are made while your child is walking (undressed). This allows for the reviewer to look for the subtle anatomical signs that can be difficult to detect underneath clothing. A referral for an ultrasound and clinical examination at six weeks of age is standard practice for all infants presenting with risk factors, irrespective of clinical findings. Ligament laxity immediately post birth can be the cause for subluxable and dislocatable hips. The second check in hospital prior to discharge helps to see if this has resolved. 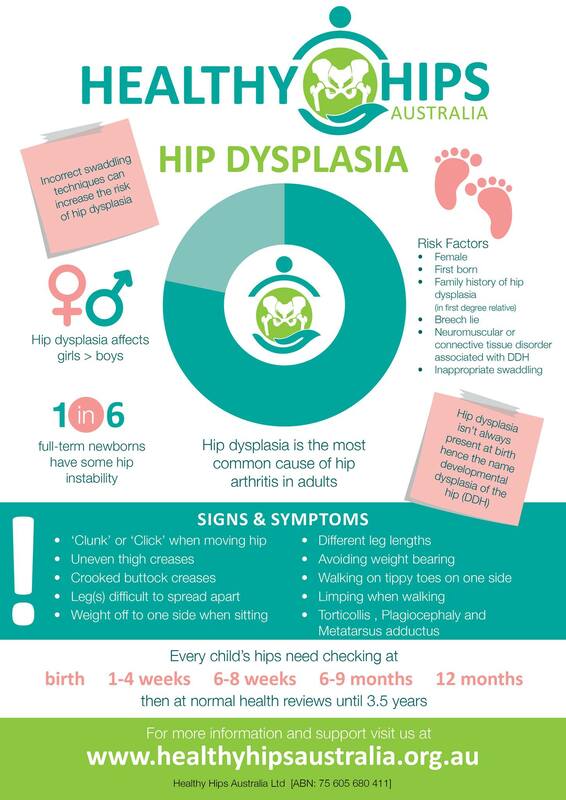 High-risk infants who also present with signs of hip dysplasia at birth, and still on discharge, can be recommended to undergo an orthopaedic review as soon as practical, which is why some babies may be seen sooner than six weeks. Confirmation of diagnosis is by ultrasound in infants less than 4-6 months, and by X-ray for babies/toddlers over 4-6 months. Hip checks are meant to be a standard practice and part of a baby’s newborn checklist both at birth and prior to discharge from hospital. Sometimes, if there are other medical issues at this time, this process can be missed. In the community, the child health nurse and/or GP are meant to include hip checks during a child’s recommended 1-4week, 6-8week, and 6-9 month check-ups. These checks a manually performed (see clinical tests below) and often occur without the parent realising, as it is a relatively quick part of the physical examination. Due to the developmental nature of hip dysplasia, it said to be possible to onset any time from birth until walking independently. Variances in diagnostic tools used and timeframes conducted vary depending on individual risk factors. If you have concerns, you are well within your rights to ask for further clarification and seek a second opinion if necessary. Page Reviewed: 28 March 2019. Information sources available here.